View More In Manual Grinders. There are many benefits to freshly grinding pepper, salt, herbs and spices for cooking and seasoning. A quality mill with a specifically designed grinding mechanism will release the aromas and essential oils of that spice. Freshly ground pepper and spices have more aroma and better flavor than pre- ground. Another advantage of using freshly ground spices or minerals (salts) is the control a mill provides for determining the coarseness (size) of a grind. A high quality pepper, salt or spice mill gives you the ability to choose and change the coarseness according to taste or necessity. Grinding mechanism: Choose a grinding mechanism that can withstand daily use: one that is well made and produces a consistent grind. Ideally, the grinding mechanism should be designed to handle a specific spice, as each spice has different physical characteristics that will benefit from different design features. Design and appearance: Whether it's traditional or modern, manual or electric, a mill can be an indispensable tool in your kitchen and a beautiful part of table decor. 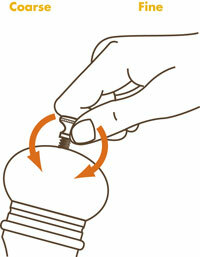 Ease of Use: A quality mill should be easy to adjust, easy to fill, and feel comfortable in the hand. Peugeot's story starts in the 19th century when the Peugeot brothers converted the family's gristmill into a steel foundry. They began producing award winning hand tools immediately after opening and went on to produce a diverse range of exceptional quality products including small appliances, bicycles and most notably, automobiles. (Although now operating as a separate company, the Peugeot car company continues the same commitment to quality and innovation that is a Peugeot hallmark). 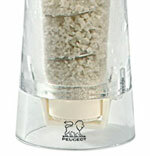 In 1840 Peugeot created their burr style coffee grinder and adopted that design to accommodate peppercorns in 1874. 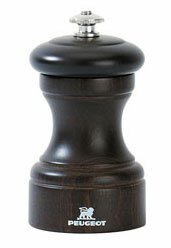 The resulting pepper mechanism design is still used today in every Peugeot pepper mill. Peugeot's iconic pepper grinding mechanism design is often copied, but never equaled. 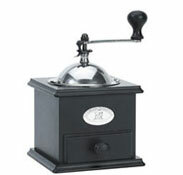 Today, Peugeot offers six unique spice-specific mechanisms plus the original burr-style coffee grinder. There are no shortcuts: each mechanism is designed to get the most out of the spices they are intended for. After more than 160 years, Peugeot mills and grinders remain the benchmark of the industry and have earned their position as the mill of choice in world class kitchens. The primary difference between Peugeot and all other brands are the spice-specific mechanisms. Peugeot has 7 unique spice specific mechanisms for pepper, salt, herbs and spices, coffee, wet salt, chili peppers and nutmeg. For each spice, there is one - and only one - Peugeot grinding mechanism, each made of the ideal design and constructed from the best material available for its intended use. All Peugeot mechanisms are made in France and carry a lifetime limited warranty. Peugeot's Salt Crushing Mechanism features two ribbed plates which work to fracture and crush coarse, dry sea salt to a consistent size. 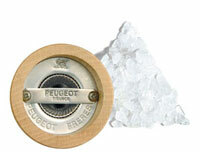 The salt grinding mechanism is made of corrosion resistant Stainless Steel, and is found on every Peugeot Salt Mill. Peugeot's Spice Mechanism is made of ceramic, and is specially designed to grind dried spices and flat leafy herbs to release their essential oils. It is particularly effective with dried aromatic herbs such as thyme, parsley, basil, oregano, and herbs de Provence, as well as dried seeds such as cumin. Peugeot's Chili Pepper Mechanism is made of case hardened steel for optimal hardness and resilience. This patented mechanism features a pre-cutting system and dual chamber reservoir. For use with dry, hot chilis such as birds tongue, African devils and Piri Piri. The Nutmeg Shaving Mechanism is made of treated stainless steel which is corrosion resistant, and offers superior edge retention. The Peugeot nutmeg shaver is equipped with a double stainless steel grater blade and a strong claw which enables the whole nutmeg to be very finely shaved, while keeping fingers safe. Intended for use with whole nutmeg nuts. Peugeot's Wet Salt mechanism has been specially designed for wet sea salt: a spiral guides the salt, ensuring that it does not stick together. The mechanism is made of ceramic because wet salt crystals are soft (wear is not an issue) but corrosive. Intended for use with damp sea salts such as Sel de Guerande. The Coffee Grinding Mechanism found in all Peugeot coffee mills is the foundation of Peugeot's grinding legacy. 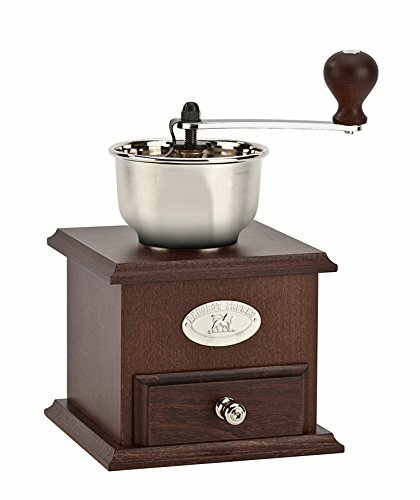 The case-hardened steel mechanism efficiently cracks and grinds coffee beans to the desired consistency:from espresso fine to coffee- press coarse. To adjust the Grind on manual mills not equipped with u'Select, turn the adjustment nut located on the top of the mill. Electric mills permit single-handed use, leaving you free to cook at the same time. Just press the button to start grinding. To adjust the grind on an electric mill, turn the thumbwheel grind adjustment (found below the grinding mechanism on electric mills that are not equipped with the u'Select system). 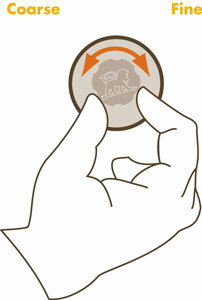 - Clockwise to obtain a finer grind, - Counter-clockwise to obtain a coarser grind. Classic Electric Salt Mills (not fitted with the u'Select grind adjustment system) are pre-set to medium and cannot be adjusted. Made in France since 1840; Made of beautiful Beechwood: Mill measures 5.1 x 5.1 x 8.75 Inches. If you have any questions about this product by Peugeot, contact us by completing and submitting the form below. If you are looking for a specif part number, please include it with your message.